It’s National Blog Posting Month, so over the course of November, we are focusing on how to blog better and faster. Catch up on our other tips for bloggers on the Blogging section of Beyond Bylines. Writer’s block is a killer. It’s been known to squash many great blog post ideas. And sometimes — when a blogger has become so discouraged by the thought of struggling through another brainstorm session — it can kill an entire blog. If you’re participating in National Blog Posting Month and have committed yourself to blogging each day, you have our deepest admiration. Today’s post is dedicated to you and anyone else who’s had problems thinking of their next blog post idea. With the help of PR Newswire’s Mary Johnson (@MryJhnsn) and Stephanie Frey (@stevefraye), we’ve come up with 31 places you can go when the “idea well” runs dry. That’s one new place for every day of the month! The first and best place to go for ideas is your audience. Leverage these eight tools to get a better handle on what they want. 1. Google Analytics: Use your blog’s data to uncover content ideas. Set up a template in Google Analytics to find inspiration from audience behavior and demographics. Visit the Google Analytics Solutions section for different dashboards, reports, and segments you can use. 2. Reader surveys: Although site analytics are useful, they only will tell you so much. Asking your readers questions and keeping an eye on what they’re discussing in your comments and on social media will give huge insight into their interests. Post an annual survey on your blog about what your readers liked/didn’t like. Or post occasional questions to your social media channels about what your audience is interested in reading or how they use your blog. 3. Topsy: I am a big fan of Topsy when I need to know what topics people are tweeting about. See how often something or someone was mentioned on Twitter over the last month by comparing up to three keywords, site domains, and Twitter handles. You also can search for links, tweets, photos, videos, and influencers relevant to your topic. 4. Storify: Although you need to create a login to use Storify, it’s free to use as an individual. Type in a keyword or phrase and get back content — news reports, blog posts, tweets, photos, and videos — from social media to see what people are interested in. 5. Social media groups: Facebook, Google+, and LinkedIn offer excellent communities for niche bloggers. As you listen to and speak with others who share an interest in your blogging topic, you’ll figure out your potential readers’ needs. Find Facebook groups in your niche by typing “Groups about Your Topic” in the Facebook search toolbar. The Google+ Communities section and LinkedIn Groups Directory also are great resources to browse. 6. Twitter chats: On Twitter, you can participate in hashtagged Twitter chats to gauge the interests of others in your niche. Check out TweetReports’ list of Twitter chats to discover the chats happening in your field. 7. Quora: There are two ways you can use Q&A site Quora to come up with blog post ideas. Follow topics related to your blog and see what people are asking. Some questions may warrant a blog post response. You also can ask questions that help you develop the post’s angle. 8. StumbleUpon: Create a free profile on StumbleUpon.com and add your blogging interests to it. Once you follow an interest and click Stumble, you’ll get a new article based on that interest. Even if you don’t write about writing, go ahead and add the Writing interest. It’s a great resource for blogging tips. When runners prepare for a marathon, they hit the gym, stretch, and go for practice runs. For bloggers, writing prompts (fill-in-the-blank cues and questions you must answer) are an excellent way to exercise your mind. 9. BlogHer NaBloPoMo: National Blog Posting Month lasts year-round on BlogHer. The massive blogging network provides prompts at the beginning of each month, with some themed around a broader topic like September’s Healing theme. Here are November’s prompts, and if you’re participating in NaBloPoMo, add your posts to BlogHer to share with others. 10. The Daily Post: In addition to providing a daily question to give their bloggers that extra push, WordPress.com’s The Daily Post also offers blogger interviews, creative writing and photo challenges, and opportunities to network virtually with other bloggers. 11. The SITS Girls: Since 2008, The Secret is in the Sauce has helped bloggers connect with brands for sponsored opportunities and grow their audience. They also post a months worth of topic ideas at the start of each month. Check out November’s 30 Days of Writing Prompts for the most recent list. 12. Mama Kat’s Pretty Much World Famous Writer’s Workshop: Besides a widget on her blog with daily inspiration, Kat Bouska’s Writer’s Workshop also features a weekly list of prompts she emails to subscribers. Participants are encouraged to engage in a weekly link up, check out what everyone else is writing about and exchange feedback. 13. The Write Prompts: Writer Maureen Wood provides daily prompts via RSS and email. Days of the week often are themed (Journal Mondays, Image Tuesdays, One Word Thursdays, etc.). Learn how to use these prompts and get more advice and prompt challenges on Maureen’s site. 14. Language Is A Virus: LanguageIsAVirus.com offers much more than writing prompts. Play one of its many writing games, read about famous writers’ techniques, or try out the haiku madlibs generator. Although the site is geared more toward fiction and poetry, creativity is needed in all writing. Language Is A Virus does a great job inspiring it. 15. Six-Word Memoir: Through tweets, blog posts, classroom exercises and books, the Six-Word Memoir Project shows that sometimes all you need to tell your story is a few words. Browse the site’s prompts, share your six-word take, and pair it with a great photo for a strong post that takes minimum effort. By sharing with the tag #sixwords, you also encourage participation from the community. Idea generators are websites and apps that will pull back a series of blog post titles and topics based on keywords you plug in. These can be helpful if you know what general topic you want to write about, but are struggling to find an angle. 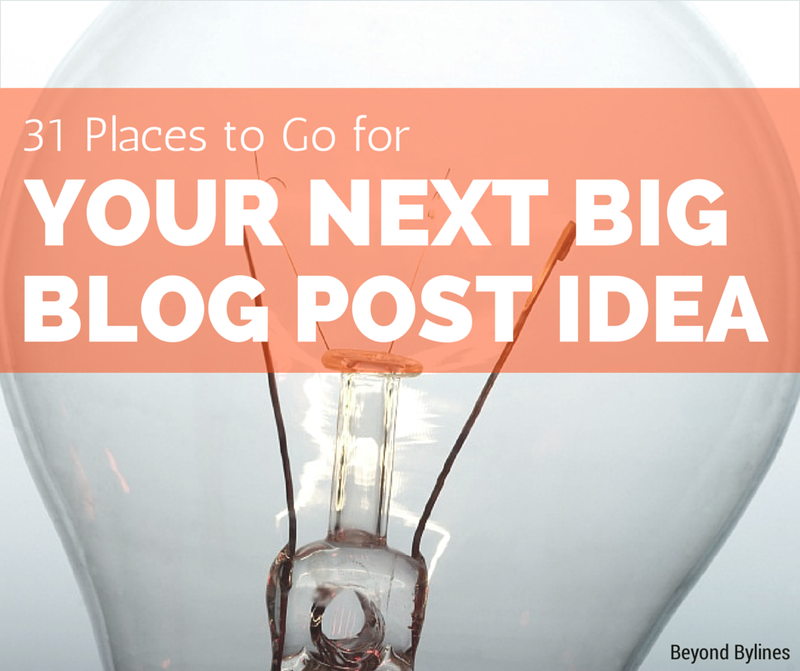 Your next blog post idea may be in the place you’d least expect. 25. Editorial calendars: Each year, newspapers and magazines like Forbes, Esquire, and Better Homes and Gardens publish their editorial calendar for the upcoming year’s issues. While these calendars exist to help advertisers plan their content, they also are a great source of inspiration for bloggers because they are in-tune with what readers want at various times of the year. Google “2015 editorial calendars” to find a few examples. Pinterest content network Ahalogy also offers a helpful breakdown of the topics that will be popular on Pinterest each month. Check it out, especially if you blog about ‘pin-able’ topics. 26. The actual calendar: While we’re at it, keep an eye on upcoming holidays and events in your niche. For instance, National Blog Posting Month inspired an entire month’s worth of posts on Beyond Bylines, while New Year’s Eve is the perfect time for a Blogger Resolution or Best Of post. Some words of caution, though: Don’t co-opt holidays that are memorializing something, and be respectful of your audience’s cultural preferences. 28. Other bloggers: You’ve probably read that other bloggers in your niche are an excellent source of inspiration. That advice is spot-on. If there’s a blog post an industry leader wrote that you don’t agree with, write a counter-point. Or try tackling any unanswered questions. However, don’t disregard other blogs or articles because they don’t fall within your niche. Lessons that can be drawn from one sphere of interest can be applied elsewhere. For instance, as a Cleveland Cavaliers fan, I’m sure I could find a metaphor about blogging somewhere within a story I read of Lebron’s return to the Cavs. 29. Guest writers: Although we’re not advocates for spammy guest post practices, you may have a colleague, friend, or respected industry contributor who could add a new perspective and writing style to your blog. You can also go back through old blog posts. Figure out which ones resonated with your audience — can you expand or update it? If a blog post didn’t do well, but it’s one you think your audience is interested in, can you change up your approach by turning it into a list, video, infographic, or slideshow? 31. If all else fails, give yourself a break: Go outside, read a poem, cook dinner, catch up on some sleep. I turn to comic books when I need a break. The combination of words and artwork allows my mind to relax and wander in creative ways. Sometimes, your best ideas will come when you stop trying to think of one. BLOGGERS: Want more story ideas and brand opportunities? Sign up for PR Newswire for Journalists, where you can customize a newsfeed based on your interests, download high-quality photos, and connect with brands and subject matter experts via ProfNet. It’s free and takes only a few moments. Get started at prnmedia.prnewswire.com. Amanda Hicken is a media relations manager at PR Newswire. Follow her on Twitter @ADHicken for tweets about the media, Cleveland, and comic books. PR Newswire’s Mary Johnson and Steph Frey also contributed to this post. Mary Johnson is a Northeast Ohio mom who runs an office by day, the iNeed a Playdate blog by night, and a family 24/7. Steph Frey is a senior customer content specialist and co-curator of @PRNLGBT on Twitter. Images of blog post prompts, idea generator and Pinterest Editorial Calendar screenshot from BlogHer, BlogAbout and Ahalogy, respectively. ← SURVEY: How Are Journalists Using Mobile Devices? Thank you for letting me contribute! It was fun to work on this together and sharing ideas. I also found news ways to be inspired.